AFTER Tabo, our link with home breaks down. 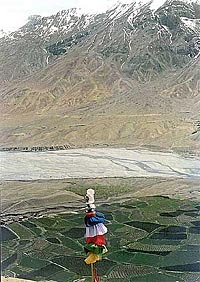 The telephone lines at Kaza have been dead for three days. Have we reached the end of land? Just about 500 km away from home! In the gathering darkness, in the gathering numbness, a pair of wild eyes gleam, as a fox bounces from the barren slope and sharply cuts across the path of our scooter. We wait for two hours for the chowkidar at the rest house. He comes back with a pail of water: "Too long, too long was the queue for a pail of water. No water, no water. Snow so little this year!" He is right. On the way, we had noted that snow seemed less this year. Unlike last year, the snow over Kinner Kailash was not that thick and tempting. "Two jugs of water for drinking and all your toiletry," the chowkidar has a deep, guttural voice, his nose seems to run. Clad in a thick weathered coat that envelops him thoroughly, he smells of country liquor as everyone on the high altitudes does. He opens the rest house for us and disappears. We rummage through all the rooms, drag the best possible quilts ("the least smelly quilts," as my companion observes, less euphemistically) into our room, collect as much water as we can, replace the wine bottle in the bathroom with a plastic mug that we discover somewhere. Finally, we sprinkle talcum powder over the bed-sheets and quilts and retire for the night. Every day, just after dawn, a little figure climbs the desert slope on the left of where we are staying. The little black figure, slowly going up hardly seems to be moving. But when I strain my eyes, without stirring, the black figure moves a bit at a time, shifting its position awkwardly quarter of an inch and then halting altogether. A massive barren slope, the inclined desert of long wobbling streaks of colours. If someone starts rolling down from the top, he would come smoothly down the incline, smoothly rolling down the slope like a wheel. A soundless wheel. Hundreds of feet down. Smoothly down! It may be a hundred. It may be thousands. This slope is so uniform in texture, it is difficult to judge the distances. 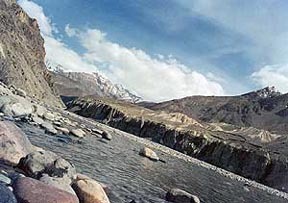 As the sunlight gradually climbs up the rocks on the opposite bank of the Spiti, the black figure inches to the ridge and finally disappears. Next year, I will pursue you black figure, beyond those desert ridges, I think. Not this year. Certainly, not this year. Certainly, the next year. Be sure and take care! A baker just on the roadside bakes fresh bread. That Swiss is there again: "Something goes wrong with us. Something gets under the skin of our head, under the skin of our heart. Something goes wrong. And we don’t know what to do. Buy one car, then other and then another and finally another." We met him at Tabo, two days before. O man, may you find peace that passes understanding, with your pockets bulging with Swiss money, and with your stamped international visa. Your ambitions run high, indeed. Amen! There is a chemist shop. It is necessary to buy skin ointment as cracks have started appearing, particularly on the finger-tips. They ache, becoming deeper everyday. These seven days have seen our complexion turning grim. In the barren stretch of 200 km, with an altitude that fluctuates between 3000 and 4000 metres, we have the first man here who dares call himself a scooter mechanic but is wary of opening its elementary lid, "If something happens, from where would I bring you a spare? At least your engine turns." Cool Spiti water in the crisp sun. At least our engines turn in the forbidden land. And at least, there is petrol here. Enough petrol to fill all our 5/10-litre plastic cans to tie and hang over the rear wheel, enough petrol to fill the mineral water bottles and stash them neatly, along with cornflakes, in the well separated compartments of the kids’ school bags that we had clamped over the front wheel. The last petrol pump, where we could have our fill, was at Poari (Kinnaur) about 200 km back. But here there is petrol, and when it comes out of the narrow nozzle in its golden sizzling transparency, it seems that Niagra gushes in all its abundance. 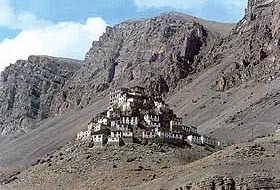 And it seems that this Kaza is an oasis for the caravans to take the momentary breath. 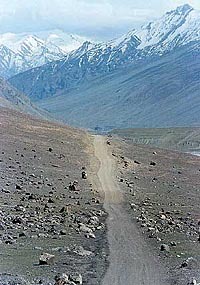 Then to proceed onwards to conquer new heights — Ki, Kibber, Chandratal, Surajtal and then even beyond. Even beyond the land from where the little black figure came.